Do you love volcanoes ? I do, so much. They are showing the silent power of our Planet and its marvellous and angry nature. The volcanoes are special openings in the Earth‘s crust through which magma, volcanic ash and gases are going out on the surface. This is a long process that is happening for thousands of years in underground, caused by a pressure of dissolved gas. 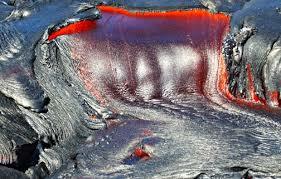 The liquid magma is actually driven by gas and its rise through the cracks of the Earth is subliming the whole pressure, turning the gas into bubbles and allowing to lava to get out. This escape from the womb of our Planet could be benign and malign, depending on the moment when lava reaches the surface and on its chemical composition. 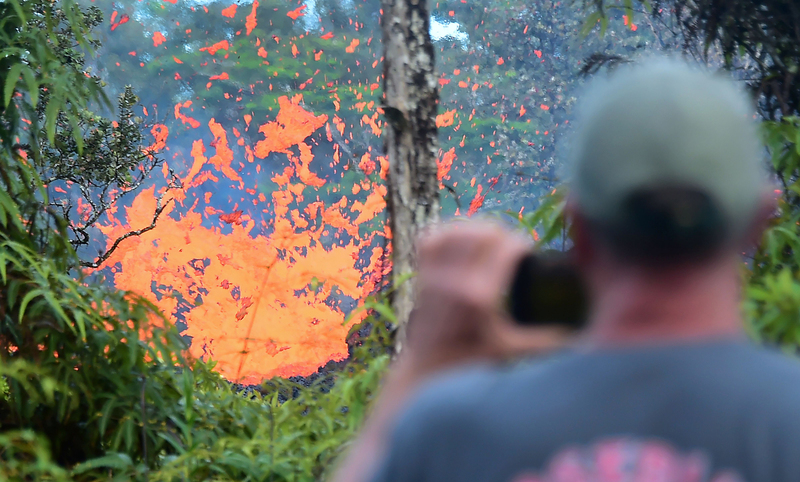 Those lavas with more gas are usually expressed in fire fountains and big explosive eruptions but they are known as explosive volcanic activities. The non-explosive volcanic activities contains more silica in the lava which is forming lava flows and lava domes. In both cases, the Earth is colouring itself in fire, passion and warning of danger for people. 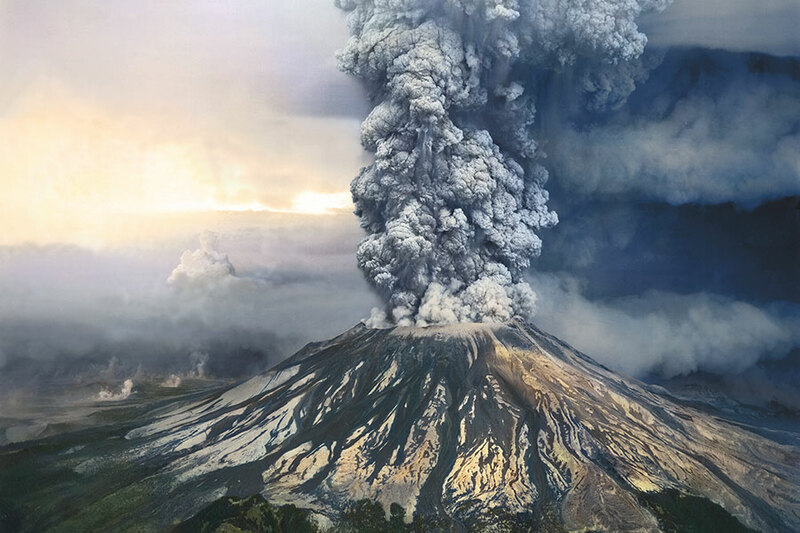 If we take a look in the history of environmental catastrophes, the volcanoes and its wild behaviour have contributed a lot in the proportion of natural disasters. Now, when we know that volcanoes are manifesting the majestic strength of our endangered Blue Planet and its authentic birth all over again, like Fenix bird, how we can deny our desire to visit them and to admire their pure glory? Believe me or not, there are people who live for visiting volcanoes and even climbing their walls. 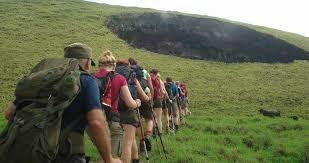 Those nature lovers are also physically very fit and their adrenaline moves them to the limit of dragon‘s cave. 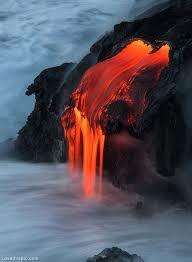 Some people are simply in love with volcanoes and consider them as their greatest passion in life. What they are doing ? They are travelling worldwide, visiting volcanoes peeks and provoking their own deepest fear. It is not easy to just pack your things and to fly somewhere where is a volcano. 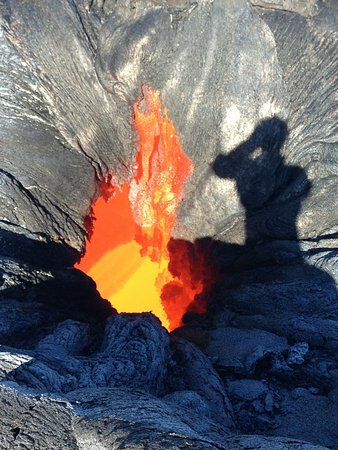 You need to be mentally prepared for such an adventure, because it could be your last one, especially when we talk about visiting actives volcanoes and their surroundings. There is something magical about visiting volcanic craters and experiencing their retreated power. You managed to be there, on the top of your own world, reaching your own summit of the panic. If we allow yourself to be path seekers rather than path finders, we will achieve that harmony with the nature or the total blackout. One adrenaline volcano climber has described that feeling as disconnection with everything what was before and everything what comes after. It was all between him and volcano, the moment of truth, the reality of to be or not to be there where you dot belong to. I would say that every time we go there, where the power of Nature is sleepy and lurking on us, we are provoking the beast of revenge, we are starring the eyes of ur own mortality and we are signing our own chapter of immortality. What is so attractive about the volcanoes ? Simply all. They are mysterious and dangerous but always in silence unless they burn out in their own anger and turn everyone and everything into the ash and history. If we recall the memory on amazing city of Pompeii and Herculaneum, that have been destroyed by wild Vesuvius in A.D. 79 and almost 2,000 people have been killed by poisonous gas, we still know that this volcano could be awaken in any moment and could again repeat the Pompeii catastrophe, but this time in the surroundings of Napoli. This volcano is one of the most dangerous volcanoes in the world and still on the first place with its rough beauty and unpredictable character. Based on the writings of globetrotters, the Vesuvius and its area is almost like landing on another Planet. The local people still believe it is their Protector and they have no fear from this volcano mountain . The outside visitors are impressed with the contrasts over there, with the empty portray of Vesuvius and rich wine hills. The nature has it all under control and in perfect and sweet harmony, in spite of grey reminders of the tragic past. The Neapolitan countryside and amazing vineyards give the precious feeling of holiday in the area where volcanic strength is shaping the daily life. 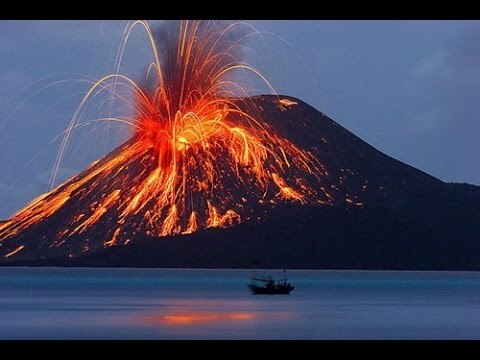 The beautiful Italy is not the only one with awesome volcanoes. 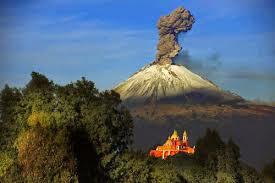 If it happens and you are somewhere in Guatemala, don’t miss a fact that there are over 37 official volcano summits. Don’t miss them in Peru, Chile,Mexico, Costa Rica, Ecuador but USA and Canada have also a lot to offer to nature adventure followers. One of the most breathtaking in America is definitely Mount St. Helens in Washington State, that stands proud on 2,549 meters with unforgettable view and hiking trip that can last between 7-12 hours. The climbing volcanoes may be a trend today but for some people is a lifestyle and individual ticket into the universe of endless possibilities. They do not care if they can solve it or not, if they will survive or not, they simply know they have to be there and they are attracted by the fire of the Planet soul. Sometimes that fire takes them forever and sometimes gives them a new perspective and the reason to fight again. Just like the scientists said, the volcanoes have helped the creation of life and if we star enough long in their burning core, instead of death, we may see the real meaning of life, it’s ancient beginning. Sarah’s fascinating and informative article reminded me of the novel entitled ‘Journey to the Centre of the Earth ’ (1864), by French novelist, poet and playwright Jules Verne (1828-1905): the story involves the Germanic professor of geology Dr Otto Lidenbrock, who believes there are volcanic tubes going towards the centre of the Earth. 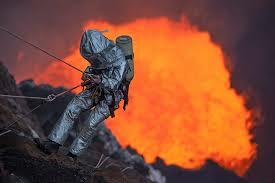 He and others descend into the Icelandic volcano Snæfellsjökull; encountering many adventures (including prehistoric animals and natural hazards), before coming to the surface again in southern Italy, at the Stromboli volcano. The novel was inspired by Scottish geologist Dr Charles Lyell’s (1797-1875) ‘Geological Evidences of the Antiquity of Man’ (1863). By that time, geologists had abandoned the literal Biblical account of the Earth’s antediluvian development and it was generally thought that the end of the last glacial period marked the first appearance of humanity. Yet, Dr Charles Lyell drew on new findings to put the origin of human beings much further back in the deep geological past. 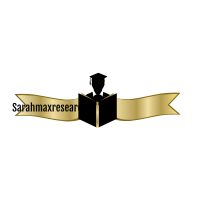 Geological Evidences of the Antiquity of Man deals with three scientific issues that had become prominent in the preceding decade: the age of the human race, the existence of ice ages, and Professor Charles Darwin’s ‘Theory of Evolution by Natural Selection’. The academic work ‘Principles of Geology: being an attempt to explain the former changes of the Earth’s surface’ (1830-33), by Dr Charles Lyell, uses the theory of Uniformitarianism to describe how the Earth’s surface was changing over time. This theory was in direct contrast to the geological theory of Catastrophism. Many individuals believed in Catastrophism to allow room for Biblical beliefs (e.g. Noah’s Flood could be described thus as a real geological event, as Catastrophism describes the changing of the Earth surface as one-time, violent events). Dr Charles Lyell challenged the believers of the catastrophic theory by studying the volcano Mount Etna in Sicily and by describing the changes from one stratum to another and the fossil records within the rocks to prove that slow, gradual changes were the cause of the ever-changing Earth’s surface. Dr Charles Lyell proved that the Earth is much older than the Biblical period of Genesis, etc., and this was highly-contentious, during his lifetime. In addition, Principles of Geology: being an attempt to explain the former changes of the Earth’s surface demonstrates that the geological processes of the inner-Earth that are occurring in the present are the same processes that occurred in the past. What an interesting and intriguing article, Sarah ! 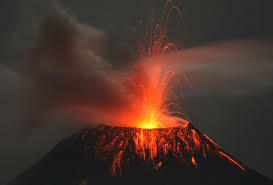 Volcanoes are definitely fascinating in the way they behave and the way they spew fire and lava in the air ! The scene is spectacular ! However, the danger associated with them is real ! The people who go near them may be too temerarious and may pay the ultimate price for their lack of poise. your mentioning of Vesuvius brought back fond memories, as I visited Pompeii/Pompei and Naples/Napoli as a youngster and saw the lava that had wrapped itself around its human victims ! It filled me with awe ! I also felt so sorry and so sad for the people who had lost their lives, especially in this cruel manner ! Nature is beautiful ! We have to be smart when we choose what we can see up close and what we should see from afar ! Thank you, Sarah, for this lovely article ! And thank you for the beautiful concomitant illustrations ! Loved this post. Beautifully written.